HOW DO I RECOGNIZE THIS INSECT? Emerald Ash Borers (EAB) is a slender, elongate insect about 1/3 - 1/2 inch long. It is widest just behind the head, gradually tapering back to the abdomen. It is a bright iridescent green to copper-green color, often with a copper colored area behind the head. Its body underneath the wings is a purplish-magenta color. 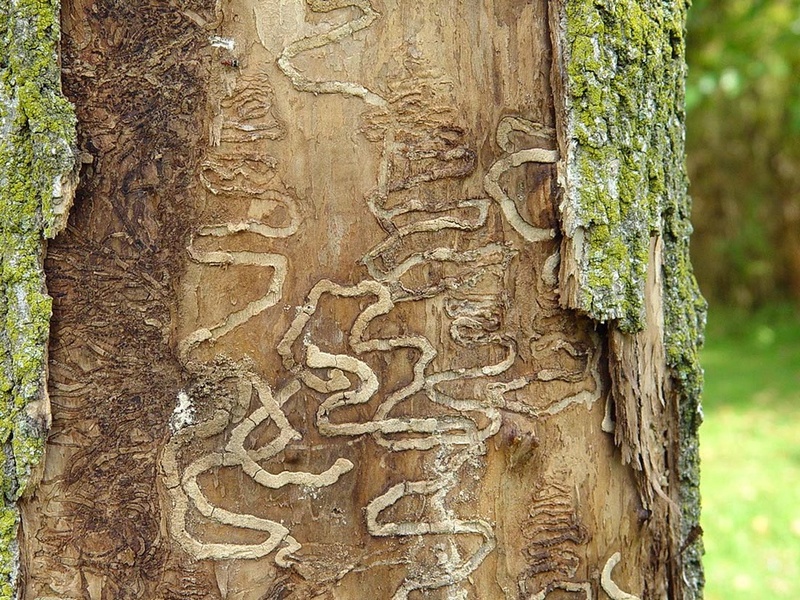 Emerald Ash Borers (EAB) generally have a one year life cycle although that can be extended to two years in a vigorous host. These insects over winter become fully grown larvae in chambers constructed under the bark of ash trees. They pupate in early spring and emerge as adults, leaving characteristic D-shaped emergence holes. After feeding on leaves, adults mate and females lay eggs on the bark or in small cracks in the bark. Eggs hatch in 7 to 10 days. The whitish larvae, called flatheaded borers, tunnel under the bark, creating a series of winding, S-shaped galleries in the phloem and outer sapwood. These tunnels girdle the trunk and branches, interrupting the flow of water and nutrients. Trees typically are killed in two to four years. When trees are first attacked by EABs, the symptoms are inconspicuous and hard to notice. By the end of the second year, thinning foliage and dieback in the crown begins to be apparent. By the third year, there is severe dieback and little foliage. Ash can tolerate small numbers of EAB larvae but trees are girdled and killed when populations become more numerous. When the adults emerge, they create small, 1/8 inch D-shaped exit holes that are characteristic of this insect, although they can be hard to see. If you were to remove the bark on the trunk of a tree showing these symptoms, you should also find the larval galleries. 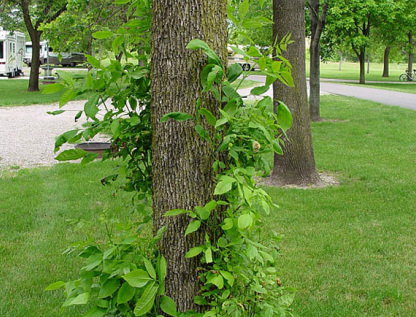 Epicormic sprouts may form on the lower trunk and major branches as the tree responds to emerald ash borer activity. Woodpecker attacks on ash could also indicate the presence of emerald ash borers. Vertical splits in the bark due to callous tissue forming over old galleries may also be seen. WHAT DO I DO IF I AM WITHIN 15 MILES OF INFESTATION? • Determine how many ash trees are on your property and decide which of them are healthy enough and important enough to your landscape to protect with pesticides. • Determine which of the unhealthy ash trees should be immediately removed or whether it can be safely left in position; ash trees become hazardous when they die and can fall down easily. You may wish to hire a professional tree care company to help you make these decisions. • Begin to remove ash trees that are in poor shape for any reason; they are seldom good candidates for treatment with pesticides. You can begin with the ash trees that pose the biggest hazards and spread removal over time. It is always best to hire professionals to remove trees. • Intersperse new kinds of trees (not ash trees!) among the untreated ash trees so they will have time to grow before EAB arrives and the ash is lost. • Begin treating valuable, healthy ash trees with pesticides. • Several effective pesticides are approved to control EAB. • Some are directly available for use by homeowners and others are for use only by licensed pesticide applicators. • Products can be applied as soil drenches, high pressure soil injections, trunk injections, trunk implants or trunk sprays. REPORTING A SUSPECTED FIND OF EAB IN A NEW AREA!! If your ash tree has symptoms of EAB infestation AND you live outside of a known infested area, please contact the Indiana DNR, Division of Entomology & Plant Pathology, at their toll-free hotline at 1-866 NO EXOTIC (1-866-663-9684). Reports of suspected EAB finds in uninfested areas of the state help the DNR keep track of the beetle's location. Your personal information will be kept confidential.